Mozambique is coming to grips with the aftermath of the cyclone which hit the country. Just five days after tropical cyclone Idia made landfall in Southern Africa, rescue workers have been hard at work in trying to rescue affected people in Malawi, Zimbabwe, and Mozambique - which has suffered many fatalities. The country's president, Filipe Nyusi, has reported that more than 1000 lives could have been lost due to the disastrous cyclone. "This is a major humanitarian emergency that is getting bigger by the hour," said Verhoosel. The flooding of the Pungue and Buzi rivers had created "inland oceans extending for miles and miles in all directions," Herve Verhoosel, senior spokesman at the UN World Food Programme told Al Jazeera. "Red Cross teams in Beira are today (19 March) distributing shelter supplies to affected families in Beira. Additional supplies for at least 3000 families are being brought in by ship from the French Red Cross’ Indian Ocean Regional intervention Platform (PIROI in French) on Réunion Island. 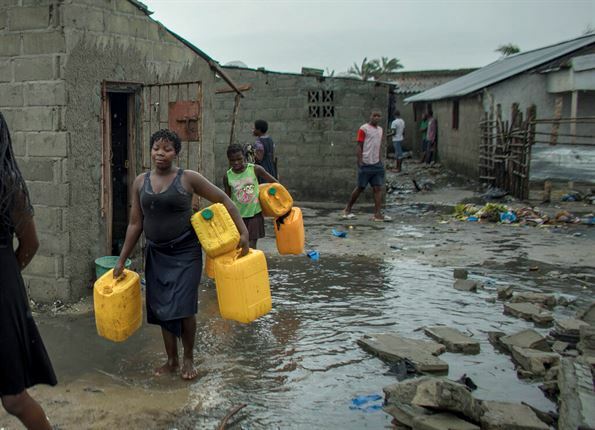 Red Cross volunteers in Beira are also handing out chlorine so that people can purify water," IFRC said in a statement. With thousands of people still at risk, head of response efforts in Beira for the IFRC, Jamie LeSueur, said that "this is the worst humanitarian crisis in Mozambique’s recent history. "It is a humanitarian catastrophe for the people of Central Mozambique. Large parts of Beira have been damaged, entire villages and towns have been completely flooded. Rescuers are scrambling to pull people trapped on rooftops and in trees to safety. Many, many families have lost everything. The agency also reports that at least 400 000 people were left homeless," he said in a statement. The organisation said "roads, bridges and crops have been washed away", adding the organisation "may need to provide 500 000 people with food assistance – ?out of a total of 600 000 believed to be in need of help". The WFP also said that "high-energy" food parcels were being airlifted to Beria, using a contracted helicopter to make deliveries into cut-off regions. The organisation says it's funding drones "to support Mozambique’s disaster management agency, the INGC, with emergency mapping". Secretary-general of the United Nations, António Guterres, has also expressed condolences to people who lost their loved ones in the disaster, adding that "the United Nations expresses its solidarity" with the affected countries "and stands ready to work with them as they respond to the humanitarian needs resulting from this disaster".